Over the last few weeks, we have been working on several projects to serve the Macon-Bibb Department of Family and Children Services. This crucial government office serves some of the most vulnerable populations in our city, often with massive caseloads, minimal funding, and dedicated but overloaded staff members. We want to bring the hope of the gospel to DFCS and to the many families they serve, and help them meet the needs they are faced with day after day. This is an ongoing partnership we are so excited about, and one of our Missional Communities started work on another project this week! 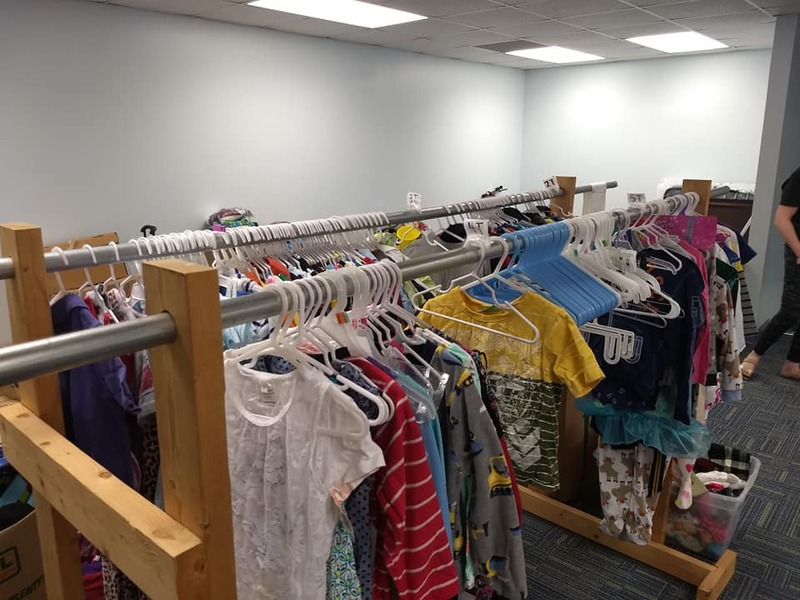 DFCS occasionally receives donations from the community of clothes, toys, household items, and much more, but doesn’t have the time or capacity to sort through all of them to make them useful and accessible to foster families. Most of the donations have been in huge boxes of miscellaneous items, making them unusable when families need them. One of the top projects DFCS asked us to tackle was to turn one of their rooms into a clothing closet. Thankfully, they have lots of available space in their offices, but it needs some organizing that they rarely have time for! This week the Smith MC started work on that clothing closet by installing shelves, sorting through massive boxes of donations, and organizing the clothes that could be used into age and gender specific boxes. There is still lots of work to do, but it was a great start to go through the bulk of the donations and sort out what could immediately be useful. When we go back, we will install two more shelves in the closet for hanging clothes, finish sorting clothes, and begin tackling the gigantic boxes of shoes that have been donated! We plan to maintain the closet and keep it organized by continuing to go in and sort new donations so it is a useful and helpful resource for foster families. We are so grateful to have the opportunity to keep going to DFCS and working on projects that make their incredibly difficult jobs just a little bit easier. Our hope is that we continue to build relationships with the people we meet and to share the hope that we have in Jesus. He is making all things new, bringing order out of chaos, and our work here is a part of that! He has made us new creatures, brought us from darkness to light, and we in turn look to the world around us and take part in renewing and restoring it in his name and for his glory. We are the kingdom present, bringing the rule of King Jesus into every place we encounter. Have you ever been somewhere and felt like an outsider? Like you just didn’t belong, fit in, or know anyone? If you’ve been there, it’s not a fun place to be. If we’re not careful our churches, missional communities, and even our families can become this way. Jeff Vanderstelt says hospitality is “making space for people to be who they are and to become more like Christ within community.” Making space for this is not always easy, but it is part of the mission God has called us to. The truth of the matter is the discipline of hospitality is deeply connected to the gospel and God’s redemptive story. Good hospitality is an outworking of the gospel, for in the gospel God is hospitable to us. J.I. Packer said, “adoption is the highest privilege of the gospel. The traitor is forgiven, brought in for supper, and given the family name.” If we truly believe that we were once the outsider who God graciously welcomed in, then we should be the first to treat outsiders as if they belong, and love them as we love ourselves. As we trace the Biblical narrative we see God caring for his people in the wilderness. God’s people are to welcome the stranger, just as he welcomed them (Lev. 19:34). We see hospitality in the life of Jesus. Jesus is constantly eating with people. He is labeled as a “drunkard and a glutton, a friend of tax collectors and sinners” (Luke 7:34). He hangs out with people hated by society, like Levi and Zacchaeus. The early church also exhibited hospitality in numerous ways throughout the book of Acts. Welcoming strangers is common practice for God, Jesus, and the early church. The truth about being hospitable is we cannot be hospitable to the stranger or outsider if all we do is hang out with our friends. We should be proactive, outward-facing, and intentional so that we will see our guests this weekend and reach out to them. Be diligent in this. A guest who is attending may represent years of prayer, service and invitation by a church member. These are people coming to us to hear and see what we believe to be true about God and the gospel. Let’s be careful to be good stewards of the people God is bringing to us. What could this look like during the different events we have going on this weekend? During our Good Friday service, find a family or someone you don’t recognize and ask them to sit with you. Get to know them and tell them if they have any questions during the service you’d be happy to explain anything they don’t understand. Good Friday isn’t your typical church service, for it’s not as much a celebration but a time of remembrance. Guests or those who aren’t as acquainted with church may have questions. Invite them to meet you for coffee or dessert after the service so you can further get to know them or answer any questions they had about the service. If you meet a family invite them to our Easter Picnic and Egg Hunt the following morning. This would be a great way to reconnect with them and continue to build a relationship. This is an awesome event to invite your friends, family, co-workers, and neighbors to. This is a very low-barrier ask for someone and chances are, if they don’t already have plans, they will come to something like this. When you’re at the picnic and egg hunt on Saturday look for people you don’t recognize. Invite them to eat with you and hang out with you some throughout the day. We will have people show up who don’t know anyone and these events do little for the Kingdom if we don’t connect with those people. An event like this will also attract unchurched, not-yet-believers so we have the awesome opportunity to introduce these people to New City Church and the gospel of Jesus. Begin a relationship with the people you meet and start getting to know them. Be prepared to share your story of what God has done in your life and be prepared to share the gospel. If you need help thinking through ways to share the gospel, check out this other blog post I wrote a few weeks ago: 6 Tips for Sharing the Gospel. Pray and expect God to work through you and your family on Saturday. Outward Facing Posture - Be on the lookout for guests. We will have lots of them on Sunday morning. Research shows that guests will determine within the first 6 minutes if they will ever return to a church. Do you know the number 1 determining factor in whether or not guests return to a church? 84% of them return if someone made a personal connection with them. Be intentional in talking to them and learning more about them, being watchful for anyone who seems to be feeling out of place or without someone to talk to. This may be hard to hear but this will require you to not huddle with your friends all morning. Make a Connection - According to Lifeway Research it takes guests at least four visits to commit to staying at a church longterm. What can you do to help them come back? Make a connection with them. No matter how good our preaching and singing is (which I think both are pretty great), guests will not stay and invest longterm unless they build relationships. Get to know them and their family, ask them to sit with you during the service, personally invite them to your MC. Be Kind and Welcoming - Be kind and welcoming to the people you don’t recognize and go out of your way to make them feel welcome. We have a Connect Team but the culture of our whole church body should exemplify hospitality. The “greet your neighbor” time before the sermon can either be the most awkward or one of the most meaningful times of the morning for guests. Don’t find your friends this week. Look for someone you don’t know, go shake their hand, and welcome them to New City. Go the Extra Mile - Don’t just tell someone where to go, show them. If someone enters in the main floor and doesn’t know where to check-in their children, walk them downstairs. If someone doesn’t know where the restrooms are, walk them around the back of the sanctuary and show them. This will go a long way in making our guests feel welcome. It is hard to believe that it is almost Easter weekend again. Easter weekend is such an exciting time to celebrate the life, death, and resurrection of Jesus. Many people will enter our services this Good Friday and Easter Sunday for the first time and we have the great opportunity to welcome them into the family of God. These 7 reminders will help us to put our best foot forward. Thank you so much for serving this weekend! Remember why we welcome guests. Through the gospel, God welcomes us (the stranger) into His family and gives us a seat at His table. We are commanded in Scripture to be hospitable. The word “hospitality” in Romans 12:13 and Hebrews 13:2 literally means to "love strangers”. We love and welcome others as Christ has loved and welcomed us. Show up on time. If you do this, your task-work will be done well before people begin arriving and this will free you up to be responsive & available to guests. Outward-Facing Posture. The point of the Connect Team is to point people to Jesus. We can’t serve our guests if we’re in a huddle with our friends. New City’s Connect Team should be proactive, outward-facing, and intentional so that we will see our guests before our guests see us. Be diligent. A guest who is attending may represent years of prayer, service and invitation by a church member. These are people coming to us to hear and see what we believe to be true about God and the gospel. Let’s be careful to be good stewards of the people God is bringing to us. Check your excitement level. Drink your morning coffee! Be energetic, excited, and happy. Give guests a great experience by showing them you’re excited they’re here. Spend some time in prayer before you serve this weekend and ask God to help give you a spirit of excitement to welcome people into His family. Pay attention to details. Pick up trash on the floor and outside. Don’t assume guests know where to go. Point them to the children’s check-in, connect bar, restrooms, mother’s room, and the sanctuary. Thank you. Last but certainly not least, your volunteer “job” is very important. When the Connect Team nourishes a culture of hospitality, we are a concrete reminder to the entire congregation that guests matter. Think of the Connect Team as "missional training wheels" for our church. Focusing on welcoming reminds people our church exists for those who are not yet a part of it. It’s not hard to think of things to pray for our children. Their health, safety, an easy path to a happy life - we want good things for our children. This is good! We should care deeply for our children and desire good things for them. This is one way we image our good Father who cares for us and loves to give us good things. However, our reflection of our good Father is not a perfect one. We are human, and our vision of what is good is not perfect, so our ideas of what is good aren’t always complete. Does that mean we have to stop praying for good friends, safety on school trips, and healing from illness? No! But it does mean we can broaden our understanding of what is good for them to include and be shaped by who God is and what he has done for us in Jesus. Scripture gives us countless ways to pray for our children that are in line with God’s character and his plan of redemption. Melissa Kruger wrote a helpful little book called 5 Things to Pray For Your Kids with the goal of orienting our prayers around God’s revealed character and his good purposes for his children. It’s a practical and gospel-centered resource and it’s less than $5! Some of her points are summarized in the article below from Risen Motherhood, and I was both challenged and encouraged by them. I hope you are too! This morning, I’m praying these truths for the kids of New City. Pray with me! Lord, please help her be able to nurse. Lord, help me understand why she’s crying. Lord, please help her to fall asleep. Lord, help her fever to go down. As my children have grown, I’ve continued to pray for the daily circumstances of their lives: friendships, sports, health, test scores. And, these are good things to pray for our children—the Lord invites us to cast all our cares on him. However, as I’ve read and studied Paul’s prayers for those he loved, I’ve also realized the fundamental importance of praying for my children’s spiritual needs. Some days, in the busyness of living, these are forgotten. Yet, my children’s greatest need is not temporary happiness, but increasing holiness. Holiness and happiness are not in opposition to one another, but are integrally linked. Holiness leads to true happiness: the eternal joy of a soul rooted in Christ. I’m praying for my child’s best and highest good when I ask God to make them holy. Paul’s prayer for the Philippians has helped guide my prayers for their holiness in four ways. “And it is my prayer that your love may abound more and more, with knowledge and all discernment, so that you may approve what is excellent, and so be pure and blameless for the day of Christ, filled with the fruit of righteousness that comes through Jesus Christ, to the glory and praise of God” (Phil. 1:9-11). We rightly desire good behavior in our children. (Please stop throwing your Cheerios on the floor and hitting your sister!) However, our ultimate goal is more than outward obedience, we want inward affection for God. Just like Paul, we can pray our children’s love for the Lord would abound more and more with each passing year. Only God can give them new hearts that beat with deep affection and delight for Jesus. May our children love the Lord with all their heart. Every day our children are learning. They learn to tie their shoes, to count to ten, to put their plate in the dishwasher, and one day, they’ll learn to drive a car (this will provide a new opportunity to pray without ceasing). They’re also learning about God. Pray that the Bible stories they learn, the scripture they memorize, and the sermons they hear would lay a strong foundation of knowledge that would provide a spiritual lens through which they understand the world. May our children love the Lord with all their mind. Today your child may be struggling to decide which lunch box to choose, but one day they’ll be making choices that shape the course of their lives. They’ll need discernment to know what friends to choose, which job to pursue, and who to marry. Their ability to make wise choices begins with a right reverence of the Lord. Pray that your child will be able to discern what is good and seek the Lord for wisdom. May our children love the Lord with all their soul. We often think of success in terms of money, fame, or academic excellence. However, God’s goal for our children is something more, something better, something eternal: a harvest of righteousness. It’s not something they can attain on their own (or something we can force). It’s the fruit of a heart that seeks the Lord. We often attempt to produce righteousness outside of relationship, but it’s only by the Spirit’s power that our children can bloom into people of love, joy, peace, patience, kindness, goodness, faithfulness, gentleness, and self-control. So, we pray, asking the Gardner of their soul to produce a plentiful harvest. May our children love the Lord with all their strength. We have so many hopes for our children. We want them to be healthy and happy and for circumstances to go well. However, more than perfect health or circumstances, our children need the Lord. Teach them his word, teach them to pray, and, most of all, ask the Lord to be at work in their hearts, doing immeasurably more than we can even imagine. May our children love the Lord with all their heart. May our children love the Lord with all their mind. May our children love the Lord with all their soul. May our children love the Lord with all their strength. “Preach the gospel, and if necessary use words.” This is a quote often credited to Francis of Assisi. The idea behind the quote is that we should be good people who do good things and that, when done well is our gospel proclamation. We should only use words as a last resort. Often this is translated as loving others. We should love others so well that our love and actions are our gospel proclamation. So we have come to believe that Jesus calls us to love the people around us and to love them no matter what, so extravagantly that no words are needed. We have come to believe that Jesus’ mission for the church is love. Much of John’s letter entitled I John in our Bibles is about how we are to love others. I John 4:19 – “We love because he first loved us.” Because He loved us, we love others. “By this we know love, that he laid down his life for us, and we ought to lay down our lives for the brothers,” I John 3:16. We also know that Jesus said that the second greatest command of all of the commands is that we should love our neighbor as we love our self (Matthew 22:39). Jesus went on to say that all of the other commands of Scripture in part are descriptions of what it means to love others. Indeed, as followers of Christ we are to love in action. As Christians we should love as we are loved and that is extravagantly and sacrificially. His love is not earned, it is an act of grace – a gift. This is how we are to love others. If there is a need and you are able, meet it! Give. Do. Act. Love is not our mission, love fuels our mission. John 3:16 tells us that it was love that fueled the sending of the Son – “For God so loved the world that He sent His only begotten Son…” We also see this in I John 3:1, “See what kind of love the Father has given to us, that we should be called children of God…” One more for good measure from John, “In this the love of God was made manifest among us, that God sent his only Son into the world, so that we might live through him” (I John 4:9). Love preceded the coming of Jesus. Love fueled the Father’s mission to redeem and restore humanity through Jesus. True love does more than meet surface needs. While it is true that we give to feed a hungry person or clothe one who is in need, our deepest needs involve the soul. Jesus, speaking to the disciples about their fear of man said, “4 “I tell you, my friends, do not fear those who kill the body, and after that have nothing more that they can do. 5 But I will warn you whom to fear: fear him who, after he has killed, has authority to cast into hell. Yes, I tell you, fear him!” In other words, fear God. Fear the day of judgment that will come for your sin. God did not simply meet our daily need for sustenance, though He could. He didn’t provide a meal and clothing, put a roof over our heads and call it done as an expression of love – though it may very well be loving. God meets our deepest need. Jesus came to live the life of sinless perfection that we cannot. He died that death that we deserve because of sin. He bore the wrath of God toward sin that we deserve for sin. Then on the third day, Jesus was raised from death, defeating death and sin and Satan. When we trust in his work to bring about our forgiveness and bring us to our Father (faith) then through that faith we are forgiven. He becomes our substitute – His righteousness is credited to us as if it were our own and our sins are given to Him and nailed to the cross as if they were His. Through faith we are forgiven. Forgiven. As far as the east is from the west, our sins are cast from his eyes. They are no more. Not only are we found “Not Guilty!” but we are found “INNOCENT!” Innocent, as if we had never sinned. Because of this, when we stand before Him who is able to not only kill the flesh but judge the soul and cast into hell, we have nothing to fear – we are innocent. We have nothing to fear – our penalty has been paid. THIS is our greatest need! God loves us too much to stop at a meal. He loves us too much to provide us with a little cash or some clothes. God’s love was made known to us through His Son, Jesus. And the Son’s love for us was made known, ultimately, not through healings and feedings, but through the cross. His mission was not to love us, it was to redeem us, to see us restored to our Father! And if we love people then we will be moved by that love to do the same! We will be moved by love to see them redeemed and restored - to tell them about Jesus. In fact, I would say that if we stop short of actually telling them the Good News (gospel) of redemption from sin and restoration to a right relationship with our Father, then we have not truly loved. This is the ultimate fulfillment of loving our neighbor as we love ourselves! As Christians, we love Jesus. We are thankful for the Gospel and all that He did to save us. As Christians we are awed by His gracious gift. It is often too difficult even for us to believe that we are forgiven and free from sin! We are made sons and daughters of the most high King in Christ. We know that our deepest and most serious need is met by God’s gift of His Son. Our eternal standing is secured, we are His. We look forward to the day when we see Him face to face. We long for the day that we are fully restored to all that He intended us to be. We can’t wait to see the new Kingdom where there is no more sin and suffering, no pain or death, where He will be our God and we will be His people. This is not only our greatest need. This is the greatest need of everyone around us – redemption and restoration. I am not saying, “Stop doing good deeds.” I am not saying stop meeting the needs of the people around you. I am saying that truly loving others doesn’t stop with those deeds. Truly loving others means that we share with them the same of hope of the gospel that we have. The mission isn’t go love. The mission is, out of your love, go make disciples of all nations, baptizing them in the name of the Father, the Son and the Holy Spirit, teaching them to obey everything that Jesus commanded (Matthew 28:18-20). Feed the poor! Clothe the naked! Care for the widow and orphan! House the homeless! Dig wells for water! Build orphanages! And don’t stop until you have proclaimed the good news of the gospel. And honestly, if our mission falls short of the name of Jesus, then it really isn’t Christian at all. Things may have been this way forever, but it certainly seems that in today’s cultural climate, the church is known more for what we are against than what we are for. I would even argue that within most churches the culture is more negative than positive. Dhati Lewis calls the following idea “anti-vision” and “vision". The idea seems to be to teach what we need to change in our lives to become faithful Christians (anti-vision), rather than teaching all the things God actually wants us to do and take part in (vision). When I finally realized that God was not simply calling us to stop doing things but He was also calling us to start doing things, my life changed completely. Yes, God is calling us away from some things but, He is also calling us to some things. James 4:7-8 says, “Submit yourselves therefore to God. Resist the devil, and he will flee from you. Draw near to God, and he will draw near to you.” God is calling us to both resist and submit. We are to submit all of our life; not to run away from something, but to run to something: Christ! In Matthew 16:18 Jesus is speaking to the disciples, “And I tell you, you are Peter, and on this rock I will build my church, and the gates of hell shall not prevail against it.” This is the proactive vision Jesus gives to his people: God is mobilizing an army to attack the gates of hell! The church isn’t just meant to abstain from the world, the church is meant to be on the offensive for mission. Jesus uses the picture of a gate in Matthew 16. Gates are defensive, they protect whatever is inside. When an enemy approached a city, the farmers outside the walls would retreat to the city gates. A city would do everything within its power to keep enemies out of their gates, because the enemy knew if they could get inside the gate, the people are vulnerable and easily defeated. But this isn’t what God called us to be. He didn’t call the church to be a city with walls not letting anyone in. He calls us to seek out the lost. This is what we see in the story of Joshua (Joshua 6:1-21). Moses was tasked with delivering God’s people to the Promised Land but once word came back that they would be defeated, he neglected God’s command to him. He was overcome by the idea of the enemy and it took 40 years for God to allow Joshua to defeat the city of Jericho and take His people into the Promised Land. The church is not the city of Jericho under attack in the story of Joshua. The church should be, like Joshua, mobilizing an army of disciple-makers to attack the enemy and darkness, and Jesus promises that even the gates of hell won’t be able to stop His church! Moses’ generation missed out on the promised land because they chose comfort and safety. God is calling us to be like the generation of Joshua and Caleb, to choose trust and faithfulness. We have been called to rally the people around us around God’s vision for mission. Two weeks ago, Pastor Keith preached from Luke 10:1-16 and challenged us to live as Sent people. The Holy Spirit has been pressing on my heart since then and one of the things He has been telling me is to believe that our God is for me and that He will protect me. Jesus said, “Go your way; behold, I am sending you out as lambs in the midst of wolves” (Luke 10:3), because He knew this wouldn’t be easy. BUT God didn’t call us to do what is easy. He calls us to be faithful. He calls us to believe that He is who He says He is. The Great Commission (Matt. 28:18-20) ends the same way the gospel began, with a promise of presence. He is for us. We can go into battle knowing that our God is good and that He is for us. We are called to make disciples. We are called to share the gospel with our neighbors, co-workers, family, friends, and acquaintances. But we weren’t called to do it alone. Our God is for us. Our God is the great Shepherd protecting His sheep from the wolves. I am committing this year to live on the offensive, constantly looking to share the gospel. Would you commit with me? At our very best, at our strongest and brightest, we are weak, frail and needy. Maybe not compared to some people, but compared to God - compared to the Creator of all that is - compared to the King who is eternal, sovereign and utterly other. The Bible is clear we are dependent on Him. He is our provider. He is gracious to love us, gracious to care for us, gracious to forgive us and in Christ make us His own. He is merciful to withhold judgment, merciful to lead us out of trouble and suffering and pain. He is merciful in our weakness. He is a good Father who is kind, loving and patient with his children. He is a dad who is willing and able and ready to give His children His best and what is best for them. We are weak and He is infinitely strong. We are frail and broken and He is unbreakable. We lack in wisdom and He is fully wise. We are prone to mistakes and He is perfectly infallible. We don’t know what the next minute holds and He know all things. And He calls to come to Him with our needs. He urges us to ask Him for help. He almost seems to plead with us, “Come and talk to me, your Father all about your wants and needs. Come and ask me for help. I am here for you. I am able.” Too often we don’t. Too often we depend on our own wisdom and abilities. Too often we lean on our own plans, our talents, systems and structures. How prideful - to ignore His calls for prayer and His offers to help because we are confident in ourselves. Truthfully, this is why we don’t pray, pridefully we don’t believe how desperately we need God. We need Him desperately to do what only He can do. We need Him to save our family members, friends, neighbors and co-workers who are far from Him. We need Him to move through politics and systems, through voting and appointing and all other means to bring about true unity, peace and justice in our city. We need Him to overhaul our broken school system and bring about lasting change for the good of students and the good of our city. We need Him to strengthen and restore families. We need Him to lead us in a fight against poverty and racism. We need Him to transform us and through us, our city and beyond. We need Him, desperately, because these are things far greater than us. We need Him, so we should pray. The truth is that we need Him, even in the small stuff, every day… so we should pray. Join us not only in your own private prayer, but join us 15 minutes before the start of each service on Sunday morning. Simply come to the stage and if you are able, kneel and talk to our Father - ask Him to do great things in your life, in the life of our church, in the lives of the people around us, in our city and our world. Ask Him to heal. Ask Him to fix. Ask Him to save. Ask Him to do what only He can do. PS - If you come for prayer and it is only you, remember, it isn’t only you! Your Father was there ahead of you, waiting for you. Kneel and pray. You will lead others to join you there. This is one of my favorite passages in all of Scripture, and maybe the most life changing for me. I grew up going to church with my parents. I remember several churches who strongly emphasized “missions” and who supported international missions and multiple international missionaries. I remember those missionaries speaking on Sunday mornings about their work in far away countries, sometimes wearing tribal clothing and always with a slide show. Missionaries were “those people.” They were a special group in my mind, called to far away places with exotic cultures and unknown languages. They were a different kind of people with a different kind of “calling.” Theirs was the calling of the Great Commission, I thought, GO to the nations and make disciples! I was learning Greek and practicing what I was learning by looking at different passages in the original language. I looked at the Great Commission and I saw something that I had never seen or heard before, at least as far as I could remember. I remember my amazement like it was yesterday! The command of the passage isn’t GO. Go is actually an adverbial participle modifying the actual command of the passage which is MAKE DISCIPLES. So it may better read, AS YOU GO, make disciples. As you go… this I had to check out! When I looked a little closer at the lives of those disciples it became apparent that not all of them WENT. Some would travel to distant places while others traveled to the market and temple and maybe their friend’s home. And wherever they went, near or far, as they went, they made disciples. Christianity grew in Jerusalem and Judea because many of those disciples didn’t go far. Christianity also grew to the uttermost parts of the world because others did. One more thing stood out to me… teaching them - the new disciples - to “obey everything I have commanded you.” These disciples were to make disciples as they went about life - baptizing them as new believers and teaching them to obey Jesus’ commands - all that he had commanded them. What had he just commanded them? His most recent command was, make disciples as you go. So if the existing disciples were to teach the new disciples to obey all of his commands it would include the command to make disciples as they go about life. Jesus wasn’t sending a few disciples to the mission fields of far away places. He was sending ALL disciples to the mission field - some to far away places and some to the mission field right where they were! What that means is that the Great Commission isn’t just their commission and it isn’t just the commission of those going to distant lands - the Great Commission is YOUR Commission. We, the whole church are a sent people. We are all missionaries, as we go. You, if you are a believer, are a missionary. These are OUR walking orders - as we go about life, we are to make disciples. What if the church, us, lived as a people sent? My Dad took me on a lot of dates when I was a little girl and those memories still stick with me today. Breakfast was, as it is now, our date-of-choice so we went to Waffle House where dad shared his love for hashbrowns with me and I discovered “pee-can” waffles. After Waffle House, we would head across the street to Burger King, Dad would order mini cinnamon rolls for us while I played on the indoor playground. But my Dad did more than share his love for hasbrowns with me on these sweet dates, he used this time to invest in me and make one very special promise. At some point, I can’t remember when exactly, he taught me to say four magic words whenever I was hurt, scared, or confused. “Daddy, I need you,” was all I had to say in order to have him by my side, helping me in any way. As I grew up, he continued to reiterate this promise, reminding me that it did not have an expiration date and, especially as I entered college, it was not limited by distance. I’ve said those four words more times than I can even remember. They apply to all situations, like falling off of my bike when I was six to rescuing me from sleepovers in my teens to coaching me through multiple college major changes. Most recently, his fulfillment of that promise looked like driving me back and forth from Milledgeville multiple times when I got a concussion during my senior year of college. I know that no matter the time of day, the distance between us, or the absurdity of the request, my Dad has my back. The promise he made me makes me feel secure and loved, but I think it did more than he even realized it would. See the thing is that my Dad’s promise to me is a beautiful reflection of God’s promise to His children. In Isaiah 41:10, God says to His people, “fear not, for I am with you; be not dismayed, for I am your God; I will strengthen you, I will help you, I will uphold you with my righteous right hand.” God says cry out to me and I will help you, which is just like what my Dad said to me. From an early age, my Dad taught me that it is okay to ask for help because there are a lot of things I can’t handle myself. There’s also a lot of problems that my Dad just can’t solve because he’s great, but he’s not God. God is with me always guiding my steps (Psalm 23) and He knows every day that has been formed for me (Psalm 139). I take comfort in the fact that I can go before my heavenly Father with the same words Dad taught me. This can be difficult for me at times though because I like to be in control; I tend to try and do things on my own rather than ask God for help. I forget the lesson my Dad taught me and think well if I just have more time to think about it or if I can just complete this one task, then everything will work out. But that’s a lie, I cannot possibly live my life without God; I would fail miserably. “Father, I need you. You are strong where I am weak and perfect when I am sinful,” has become a constant refrain in my prayers especially with college graduation only a few months away. God’s plan for my life is perfect and He is where my joy comes from so I must humble myself and ask for help even if the solution won’t be as easy as giving me ice cream after I fall off my bike. The next time you feel hurt, scared, or confused try praying and saying, “God, I need you.” Because doors are going to close, people are going to die, and you’re not going to know what comes next, but there is someone who does and He is the ultimate healer and protector. P.S. Dad, if you’re reading this, I love you very much. As we near the end of February, much of our zeal for the ways we want to be better in 2019 is beginning to dwindle. Gym memberships are left unused, snooze buttons are well-worn, and our Bibles sit on the coffee table unopened. This is not new, and it is not surprising. As broken humans in a fallen world, we all sometimes take two steps forward and one step back at some point in our efforts to grow as people and as disciples of Jesus. This is not reason to feel shame and guilt, but our inconsistency should impel us to refocus and try again. Because of Jesus’ perfect life, death, and resurrection, we can trust that our record before the Father is perfect and blameless. We need not dwell in shame for our failures because the righteousness of Christ has been placed on our account! What grace! At the same time, we can gain motivation to live faithfully by looking to Jesus. The one true God, creator of the universe, loved me and gave himself for me. He has given me his perfect record in exchange for my failure and has called me loved and accepted. I can look to him, grateful for the amazing work on my behalf, and start again. With the help of the Holy Spirit, I take another step toward faithfulness. So if you’re feeling discouraged about your Bible reading plan and thinking you’ll try again next year, I want to encourage you to try again tomorrow (or today!). Kathleen Nielson is a Bible teacher and author and she wrote the following article for Desiringgod.com to do just that. Look to Jesus, the one who has made you right with God, and then open your Bible again (or your CBR app) - eager to know the one who made you and loves you. Why? Instead of just the guilt-inducing, duty-bound statement, “I should read my Bible,” why not ask why you should read it? And why ask about tomorrow (as opposed to in general)? Tomorrow is concrete. As I type this, I’m flying back to the U.S. from Indonesia, arriving late afternoon. I will pick up milk on the way home today, because I know I will want milk in my coffee tomorrow morning. And why read my Bible while I’m drinking that coffee? The coffee’s not optional. Well, I suppose in the end the coffee really is optional, but is the Bible reading optional? What will draw me to stop everything else and take the time to read Scripture and pray through its words? The question, instead of setting rules in front of me, gets at the soul inside me: Why should I read my Bible tomorrow morning? 1. My soul gets hungry. I will get hungry, and I will eat (unless I’m fasting or ill). That’s how bodies are made: we need food to live, and our bodies tell us so day by day. Our souls are hungry as well, for we humans are made to live on the word of God. We have God's word on this: “Man does not live by bread alone, but . . . by every word that comes from the mouth of the Lord” (Deuteronomy 8:3; Matthew 4:4). We live as we feed in faith on God’s inspired word. In that word we find Jesus the living Word, the bread of life (John 6:35). Disturb me, my soul, with your growlings. Am I restless, or discontent? These may be hunger pangs. 2. I say I love God. Let’s confront ourselves: Can we love God and not listen to him consistently and attentively in his word? We turn our ears to the seemingly endless murmurs of daily needs, but the end will come, and on that day everyone will listen to his voice. Oh, that his voice will come to us then as a beloved voice, one we know, one we’ve followed into his presence through his Son. 3. The God of the universe has spoken. It’s a wonder. We forget the wonder again and again. Just like we forget the wonder of the Word made flesh, as Christmas passes. We’re compelled by a political leader’s words, or a controversial article gone viral — or a call from someone we love who lives far away. We’ll stay up or wake up for that. 4. I must share what he has said. How can I proclaim this word? I am fearful, and sinful. I am busy, and with good things. The world is unreceptive and unkind. I will get to this in time. Be quiet, my self-full soul that feeds on fear. Feed instead on the word that makes us wise for salvation through faith in Christ Jesus. Depend on the Spirit, by whom God breathed out these words, to understand and communicate them adequately. And look to God’s people, the body of Christ. What a mercy that we are not called to read and speak the word alone. Our daily bread comes as part of the feeding of God’s people, gathered regularly to worship, learn, and pray — and then to go out together, to live and share good news. How comforting to receive Paul’s plural exhortation to “let the word of Christ dwell in you richly, teaching and admonishing one another in all wisdom, singing psalms and hymns and spiritual songs, with thankfulness in your hearts to God” (Colossians 3:16). 5. God has given me work to do. We’re just a few weeks into a new year and perhaps already frustrated by our work — overwhelming, or unsatisfying, or elusive work. If we could only remember this: there is no way my daily callings will find their proper place apart from the calling of God in Christ — to which I must constantly tune my ears according to God’s word. The Bible promises and equips us for good works that are not separate from our daily work; they are the joyful calling that shapes all we do. Dull soul of mine, please hear God’s word tomorrow, and believe tomorrow, that I am, and all God’s people are, God’s workmanship . . . “created in Christ Jesus for good works, which God prepared beforehand, that we should walk in them” (Ephesians 2:10). Though these reminders can help wake up our souls, we will still wake up tomorrow morning facing the urgency of bodies and families and friends and appointments and emails and deadlines. It’s not simple, at any stage of life. It does help to make provision in the midst of busyness: for example, this year I’m using an online Bible reading plan that sends me daily links to the next four chapters in the M’Cheyne Bible reading plan. If I can’t sit down quietly with coffee and Bible in hand, I can easily do what I did today: click on my next chapter and read while waiting in a car or standing in a line. More and more, the wonder of it does break through: the very voice of God. What everyone will hear in the end. What we live on today, and tomorrow. Whether you celebrate Valentine’s Day or not, there won’t be any getting away from the advertisements and social media posts about love in the next few weeks. So we decided to have a few special books on our resource shelves about singleness, dating and marriage. We hope they will be an encouragement to you, no matter what your relationship status is. Read their descriptions below and pick one up in February! Our desires for intimacy are powerful. This power can be constructive or destructive. Our satisfaction and our safety will be ensured if we can aim these powerful desires toward divine purposes. Many have discovered that where there is a lack of intimacy, addiction often rises to take its place. How can a young person navigate such troubled waters? Is there hope out there? As you know (hopefully), when we are choosing books for our resource shelves, we try to provide diversity in our selections. In other words, we don’t just want to have books authored by white men. We make an effort to have books written by women and people of color, because we believe that different life experiences provide valuable perspectives. We want New City to be a diverse church, because God’s kingdom is diverse. For Black History Month, we will have these three books on our resource shelves. Check out their descriptions below and be sure to pick one up in February! The cliché is that those who do not learn from the mistakes of the past are doomed to repeat them. But Thabiti Anyabwile contends that it is not the mistakes we must study; it is the people who have overcome them. So he presents three of the most influential African-American pastors in American history who can teach us what faithful ministry entails. Lemuel Haynes (1753-1833) reminds pastors that eternity must shape our ministry. Daniel A. Payne (1811-1893) stresses the importance of character and preparation to faithful shepherding. And Francis J. Grimké (1850-1937) provides a vision for engaging the world with the gospel. While they are from the African-American tradition, they, like all true saints, belong to all Christians of every background and era. Distinctive for its use of rare and out-of-print messages, Anaybwile's work is valuable as a reference as well as a devotional resource. On the Last Day every tongue and tribe will be represented in the glorious chorus praising God with one voice. Yet today our churches remain segregated. Can we reflect the beauty of the last day this day? United will inspire, challenge, and encourage readers to pursue the joys of diversity through stories of the author's own journey and a theology of diversity lived out. It’s time to capture a glimpse of God’s magnificent creativity. In the pages of United, Trillia Newbell reveals the deeply moving, transforming power of knowing—really knowing—someone who is equal yet unique. As we learn to identify in Christ rather than in our commonalities, we begin to experience the depth and power of gospel unity. African Americans have a rich and compelling Christian heritage, one that stretches back to foundational figures such as the church fathers Augustine and Tertullian. Yet white Christians often expect their black brothers and sisters to embrace a Eurocentric theology that marginalizes their own experiences and traditions. In this book, Anthony Carter draws both black and Reformed theology together, showing how Reformed theology's biblical stance addresses African-American experiences such as the horrors of the transatlantic slave trade and oppression by so-called Christians. Carter also explores a few of the ways that an explicitly black theology can enhance our understanding of God and his Word, no matter our ethnicity. Lately I’ve been frustrated with myself for how forgetful I can be. Not just forgetting to thaw the chicken for dinner, or move the laundry from the washer to the dryer, or why I walked into this room. I’ve been frustrated with how easily I forget the truth. The Lord has been reminding me of some things this week that I thought I had long settled. So why do I keep forgetting? It is frustrating to be so forgetful. When I’m confronted with a truth I have forgotten and am failing to believe in my present circumstances, I often feel discouraged. There are truths about marriage I could have repeated to you when I was in the youth group that I still struggle to believe and apply. There are truths about motherhood that I parroted to friends before I ever held my own baby that are now so difficult to hold on to in moments of fear. There are truths about my identity as a child of God that are written in pretty script on lots of journals that I sometimes can’t bring myself to remember. I forget. And I get frustrated. Why can’t I just figure this out? Why do I have to be reminded over and over of the truths of the gospel? Why do I still struggle with this? It’s enough to make a goal-oriented type-A gal like me throw up her hands in despair. Why can’t I just accomplish this already and move on?! Because I am forgetful. Because I am broken. Because I need help. And I’m not alone. Scripture and my own experience tell me that God’s people have a history of forgetfulness. The Bible recounts story after story of the Israelites forsaking the God who rescued them in favor of lifeless idols. Jesus’ disciples too failed to understand who he was and wished instead he would be a king like they expected. We believe, and then we fail to believe. So what hope is there for us, a people who forget time and time again? Mercifully, God does not throw up his hands in despair when his people forget. The Bible is full to the brim of God reminding a forgetful people that he is who he says he is and that he is faithful when they are not. Deuteronomy 5:15 - You shall remember that you were a slave in the land of Egypt, and the Lord your God brought you out from there with a mighty hand and an outstretched arm. Therefore the Lord your God commanded you to keep the Sabbath day. Psalm 78:35 - They remembered that God was their rock, the Most High God their redeemer. Psalm 143:5 - I remember the days of old; I meditate on all that you have done; I ponder the work of your hands. So when I forget, I should not despair. Instead, I lock arms with the many people who have come before me, and I remember. I look to the wondrous works he has done and remind myself that he is my rock, the Most High God, my redeemer. I look to the cross and remember that the God of the universe – the One who created all things – loved me and gave himself for me. I rehearse this story over and over and ask God to help me believe in the midst of my forgetfulness. I pick up my Bible and ask God to teach me, I talk with my friends and ask them to help me remember, and I sing the gospel story in the gathered body of Christ on Sunday morning. The practice of faith is just that - a practice. A habitual process of repeating the truth of the life, death, and resurrection of Jesus and how that changes everything about me and the world. I do not despair over how long it is taking me to remember (the Israelites wandered in the wilderness for forty years because of their disbelief, but God still brought them to the promised land). Instead I preach the gospel to myself and praise God that he is merciful to remind me of the things I’ve forgotten. And I keep believing, a little more today than yesterday. So if you are like me, and you are frustrated that you can’t remember all the things you should, know that God is not frustrated with you. If you put your faith in the finished work of Christ on the cross to make you a child of God, you can rest that your Father wants to remind you. Do not despair in your forgetfulness, but do not stay there. He wants you to look to him, remember all that he has done for you, and walk in that truth. Loneliness is a weird thing. I think because it sneaks up on you when you’re preoccupied with other things. And it’s usually the by-product of other struggles and insecurities. We are stressed, anxious, grieving, depressed, feeling like a failure, and we think we are the only ones who feel that way, and if we tell anyone about our deepest struggles, they will think badly of us, or run from us. So we keep it to ourselves. And we sink deeper into our worries and fears. And we believe the lie that we are alone. I’m probably one of the last people that others would think this of, but I have struggled with feeling alone for a lot of the last several years. At least some of it for me has been motherhood- spending so much of my days with little people, feeling like a terrible mom, wife, or friend at times, being physically exhausted, spiritually drained, and feeling socially isolated. My fleshly tendency is to stay there. The last thing I want to do is admit weakness or vulnerability. My sinful pride would keep me from being honest about this struggle, from pursuing meaningful relationships with other women who may feel the same, from allowing anyone into my brokenness. My selfishness would cause me to desire convenience and ease over the sacrifice and effort of close friendships. But here’s the truth: If you are a believer, because the Father turned his face from his Son in his dying moments, because Jesus was utterly alone as he took his last breath, your Father will never turn his face from you. Even if you feel lonely, you are NEVER alone. One of the last things Jesus said before ascending into heaven was, “I am with you always.” And because he took on flesh and was tempted as we are, he knows our struggles. He has stepped into our weakness. He is not surprised or disgusted by the person we try to hide from others. In fact, he died to remove our shame and guilt, and to give us his righteousness. My sin and my struggles are not my identity. My identity is rooted in who Christ is and what He has done. This means I don’t have to fear letting others into my ugliness. We were not created for loneliness. From the very beginning, God saw that it wasn’t good for Adam to be alone. His plan for humanity has always been for us to be in relationship with Him and with others. So if you’re feeling lonely - take it from me - you are not the only one. But hear this - really HEAR this - it’s not true. You have a Savior who loves you and stands ready for you to run to him. And if you are in Christ, you are a member of the family of God. And because the Holy Spirit has sealed us, nothing can make those things untrue. Remember the gospel. Remember who Jesus is, what he has done, and who you are in Him. And remember that He is with you always. Maybe you’ve heard or read Penn Jillette’s words about Christians sharing the good news of Jesus. Penn Jillette has a pretty unique perspective on this as an atheist. Take a minute now to play the video. “How much do you have to hate somebody to not proselytize? “ Maybe like me you have never really thought of it as hate. That description stings. At the very least it is loving yourself more than loving someone else and that might as well be hate. If my house was on fire and you were aware and I wasn’t and you didn’t tell me because you were worried that you might not have all of the right answers to my questions or you were afraid that I might be upset that you rang the doorbell and made my dog bark then you really don’t care about me or the danger I am in - you care about you. And how you might be perceived. And that is not anything close to loving me as you love yourself. If your house was on fire you would want to know. If there was genuine danger, you would want someone to tell you. And if I loved you more than I loved what you thought of me, or at least the same as I love me, I would tell you. I’m stopping here… to repent for my own lack of love. And to pray that God would help me to love my neighbor more and myself less. ** This is part 3 in a series of blog posts on Radical Missionality. Anna’s heart, it seems was bursting with joy. She couldn’t keep what she had seen to herself. I love this story. Anna had been waiting. She stayed at the temple night and day praying, fasting, seeking God and looking for the Promised One. Then it happened. Mary and Joseph brought the baby Jesus to the temple. Simeon the prophet saw them and recognized Jesus as the Promised One. Anna saw what was happening and she too realized that the one she had prayed for, the one she had been waiting for had come! He was there, the savior of God’s people. We see then that after meeting the family, she talked about the child to EVERYONE who was looking for God to rescue Jerusalem. Anna told everyone about what she had seen and heard that day in the temple. She couldn’t wait to tell them that the rescuer had come, salvation was near. Anna was filled with Joy. That’s why she told everyone she could. Her joy overflowed into telling anyone who would listen. She didn’t tell them because she had a duty to tell them. She didn’t tell them because she wanted to be obedient. She didn’t tell them because she needed to, was expected to, or had to. She told them because she couldn’t contain the joy. He was here! He has come, the savior. And he has saved us, those who trust in his life, death and resurrection. He has forgiven our sins - past, present and even future. He has taken the righteous wrath of God that we as sinners deserve. He bore that wrath on the cross. He has not only forgiven our sins but graciously he has granted to us his holiness. We are not just forgiven, we are made holy and pure, without spot or blemish. He has made us sons and daughters of God, the King. He has secured for us a place with our Father, forgiven and free forevermore. He has promised that he is coming back to gather us, God’s children, and when he does he will right all of the wrongs, defeat all of his enemies, and fix all that is broken. This is beautiful grace. It is a gift. It isn’t what we deserve. It isn’t what you deserve for your wrongs. It isn’t what you deserve for your willful rebellion, for the way that you have treated others, the way you have ignored what is good and shunned the father who loves you. What we deserve is wrath. What we deserve is sin’s penalty - eternal condemnation and separation from God. This is beautiful grace… which should bring us great joy. It did at one time, for me. It still does, but I remember those early days, the weeks and months after first seeing the gospel of Jesus Christ as the incredibly good news that it is. I was changed! I wanted to know more, to do more, to tell more because in the moment I believed, I was filled with joy. I understood for the first time the great depth of the Father’s love and the great grace that was needed for someone as sinful as me. That I could be so loved, so desired, so forgiven - it all filled me with joy, the kind of joy that cannot be contained. I want that joy again. I want that joy for us, New City. 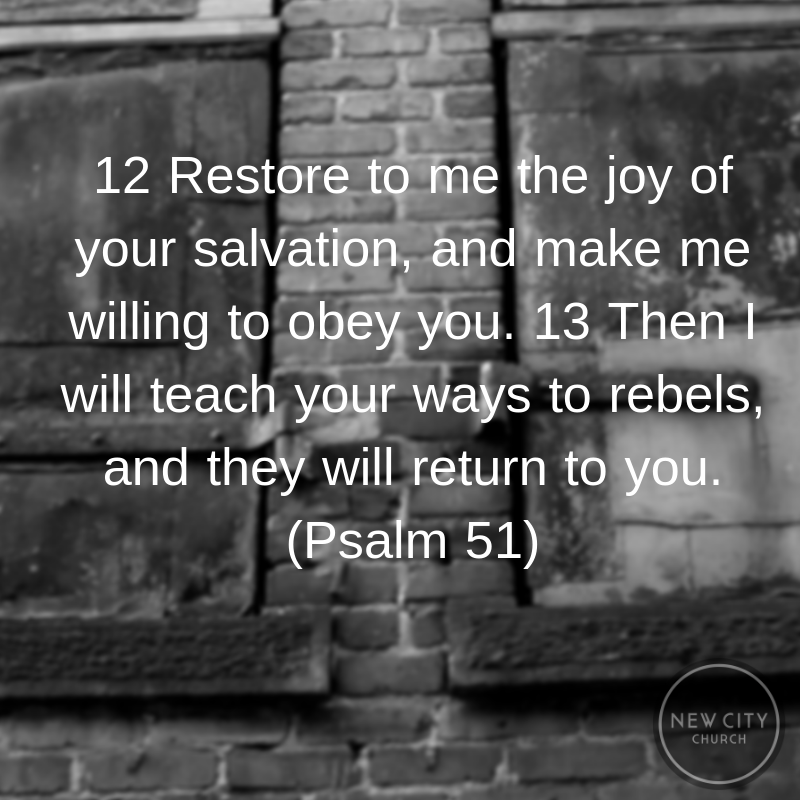 I am praying for it, that God would restore to us the joy of our salvation. I’m praying that like Anna we would be so overwhelmed with joy, it could not be contained! I’m praying that my joy and your joy in all that Jesus has done for us and the beauty of his grace toward us would overflow from us like a river of hope and life to everyone around us. I’m praying that for you. I think that is where genuine, radical missionality begins, with our own joy in salvation. That missionality, like Anna’s doesn’t come from a sense of duty. It isn’t a matter of working for obedience. We don’t share because we need to, or it is expected or because we have to. That missionality naturally happens when our joy cannot be contained. Lord, Restore to me the joy of your salvation, and make me willing to obey you. Will you pray this with me? For me? For us? Pray with me that once more we might be filled with that life giving, overflowing joy - for the good of His people and for His great glory. ** This is part 2 in a series of blog posts on Radical Missionality. It has been for a little while, maybe a couple of years. I don’t think it happened all at once. It was more of a drift. An imbalance. I spoke recently with a pastor friend who expressed a similar drift… the drift away from radical missional engagement. When New City Church started our deep desire was to see the gospel radically transform the people around us and even our city. Our passion for mission had an edge to it. We were willing and even excited to involve ourselves in places that churches weren’t typically involved. We were willing and even excited to engage with people that other churches wouldn’t engage with. In fact we started New City for that purpose! We planted ourselves and the gospel in the heart of a broken and broke down city because we believed God wanted to do something radical to rescue fallen people far from Jesus. Acts 26: 28 Agrippa replied to Paul, "In a short time you will persuade me to become a Christian." C: So, explain to me your vision for the church and the city? Me: Well, the short is city renewal - we describe it as transformation. In leadership, we often ask the question, 'If the Kingdom of God were present in the city today, what would it look like?' We believe that the church should be a glimpse of the Kingdom, therefore we should see tangible transformation because of the presence of the church. Me: Well, if the Kingdom of God were present in Macon, would there be homeless people? Me: We don't believe that our presence will eliminate homelessness in Macon, just as we can't usher in the true and final Kingdom. However, if the Kingdom is present in and through us, then we should make a positive difference in the homeless community. If the Kingdom were fully present, would there be ugly, broken buildings? Me: So we desire to see a tangible change to the buildings downtown. We will - through volunteers - help the Facade Squad when they line up facades to be worked on. We believe that the church, as a glimpse of the Kingdom should be an agent of transformation in our city. C: Keith, that's why I love you guys. Hearing what you say makes me want to believe. I feel like the King that Paul pleaded his case to. The conversation was soon interrupted and C was out the door. I was awed that such a Kingdom vision would carry such power. 29 And Paul said, "I would wish to God, that whether in a short or long time, not only you, but also all who hear me this day, might become such as I am, except for these chains." I still have them on some level, but I cannot help but feel my own drift from radical missionality - from believing that God was going to do something only he could do to save the people around me. Worse, I feel that I have contributed, as a leader, to the drift of our church from radical missionality. For even that possibility, I am repenting! I’m praying that God would re-ignite that passion for the miraculous salvation of those far, far from Him. I’m praying that as a church, our hearts would burn for those who don’t love and follow Jesus. I’m praying that we would engage the people that other churches won’t. I’m praying that we would be overwhelmingly uncomfortable with the lostness all around us. I’m praying that we would be willing to cross lines and take chances for the sake of those around us and for the glory of our great God. I’m praying that for myself, for you. I’m praying that for us - that we would be a people snatching others from the flames of judgment (Jude 1:23). Lord, may we never be a church that does nothing more than church stuff for church people. Help us to once more be radically missional - to believe that you want to do amazing things, miraculous things to bring your children close to you. Set our hearts on fire.